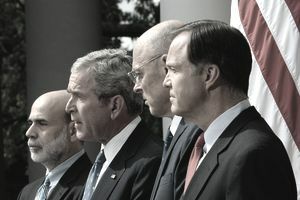 The Federal Reserve and the Bush administration could have prevented the 2008 financial crisis. But they ignored the early warning signs. In November 2006, the first leading indicator revealed trouble. The Commerce Department reported that new home permits dropped 28% in a year. That meant new home sales would slump for the next nine months. But no one could believe that housing prices would fall. It hadn't happened since the Great Depression. The Federal Reserve Board remained optimistic. In the November Beige Book report, the Fed said the economy was strong enough to pull housing out of its slump. It pointed to strong employment, low inflation, and increasing consumer spending. In 2006, the Fed ignored the second clear sign of economic distress. That was the inverted yield curve for U.S. Treasurys. An inverted yield curve happens when short-term Treasury note yields are higher than long-term yields. Regular short-term yields are lower. Investors need a higher return for tying up their money for longer. But they will invest in a long-term bond for protection from a downturn. The yield curve had also inverted before the recessions of 2001, 1991, and 1981. Economists ignored this sign because interest rates were lower than in prior recessions. Most of them thought housing prices would rise once the Fed lowered interest rates even more. They believed the economy would still grow 2% to 3% that year. The economy had plenty of liquidity to fuel growth. In fact, the 2007 GDP growth came in at 1.9%. But economy-watchers didn't realize the sheer size of the subprime mortgage market. It created a "perfect storm" of bad events. First, banks were not as worried about the credit-worthiness of borrowers. They resold the mortgages on the secondary market. Second, unregulated mortgage brokers made loans to people who weren't qualified. Third, many homeowners took out interest-only loans to get lower monthly payments. As mortgage rates reset at a higher level, these homeowners could not pay the mortgage. Then housing prices fell and they couldn't sell their homes for a profit. As a result, they defaulted. Fourth, banks repackaged mortgages into mortgage-backed securities. They hired sophisticated "quant jocks" to create the new securities. The "quants" wrote computer programs that further repackaged these MBS into high-risk and low-risk bundles. The high-risk bundles paid higher interest rates, but were more likely to default. The low-risk bundles paid less. The programs were so complicated that no one understood what was in each package. They had no idea how much of each bundle were subprime mortgages. When times were good, it didn't matter. Everyone bought the high-risk bundles because they gave a higher return. As the housing market declined, everyone knew that the products were losing value. Since no one understood them, the resale value of these derivatives was unclear. Last but not least, many of the purchasers of these MBS were not just other banks. They were individual investors, pension funds, and hedge funds. That spread the risk throughout the economy. Hedge funds used these derivatives as collateral to borrow money. That created higher returns in a bull market but magnified the impact of any downturn. ​The Securities and Exchange Commission did not regulate hedge funds, so no one knew how much of it was going on. In March 2007, the Fed realized that hedge fund housing losses could threaten the economy. Throughout the summer, banks became unwilling to lend to each other. They were afraid that they would receive bad MBS in return. Bankers didn't know how much bad debt they had on their books. No one wanted to admit it. If they did, then their credit rating would be lowered. Then, their stock price would fall, and they would be unable to raise more funds to stay in business. The stock market see-sawed throughout the summer, as market-watchers tried to figure out how bad things were. By August, credit had become so tight that the Fed loaned banks $75 billion. It wanted to restore liquidity long enough for the banks to write down their losses and get back to the business of lending money. Instead, banks stopped lending to almost everybody. The downward spiral was underway. As banks cut back on mortgages, housing prices fell further. That made more borrowers go into default, which increased the bad loans on banks' books. That made the banks lend even less. Over the next eight months, the Fed lowered interest rates from 5.75% to 2%. It pumped billions of dollars into the banking system to restore liquidity. But nothing could make the banks trust each other again. In November 2007, U.S. Treasury Secretary Henry Paulson realized the true situation. The banks had a credibility problem, not a liquidity problem. He created a Superfund. It used $75 billion in private sector dollars to buy bad mortgages. They were even guaranteed by the Treasury. But by this time, it was too late for a public/private partnership to solve the problem. Panic had already gripped the financial markets. It became apparent that $75 billion was not going to be enough. Two things could have prevented the crisis. The first would have been regulation of mortgage brokers, who made the bad loans, and hedge funds, which used too much leverage. The second would have been recognized early on that it was a credibility problem. The only solution was for the government to buy bad loans. But the financial crisis was also caused by financial innovation that outstripped human intellect. The potential impact of new products, like MBS and derivatives, were not understood even by the quant jocks who created them. Regulation could have softened the downturn by reducing some of the leverage. It couldn't have prevented the creation of new financial products. To some extent, fear and greed will always create bubbles. Innovation will always have an impact that isn't apparent until well after the fact.